Riseisha Rectovenus of Osaka managed by Ms. Megumi Kitta (Photo), a member of Athletes Commission of IBAF, and in its second year since the start of the club, won close contest against Fukuchiyama Seibi High School team (Kyoto) by 2-1. The record 36 teams throughout Japan, including 7 newcomers, played round robin in 12 groups of 3 teams each since August 3, and the 12 winners from each group competed in knockout competition. 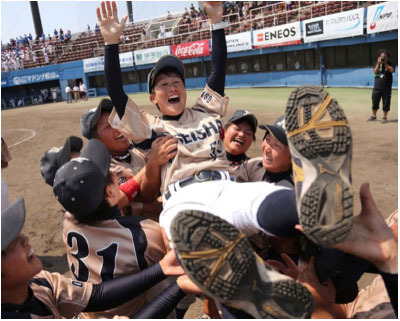 Elsewhere, Yonan Gakudou Club (Tochigi) defeted Hasami Konosu Boys Baseball Club (Nagasaki) by 4-2 in the 12U Japanese Rubber Baseball National Championship at Jingu Stadium on August 7. Pitcher Honma and Catcher Ikui of the winner are girls and it was the first time for the Championship to see girls’ battery play, let alone win a game. They lost the second game on August 7.